How do you know when it is time for new dentures? When is it time for new dentures? There are many factors that decide this. Here is an example of an old denture a patient brought in to my office. This denture has flat worn back teeth, was missing a front tooth, had a corner of the denture base cracked off, and was loose. The denture was about 10 years old. This denture could have been fixed, serviced and repaired by doing the following procedures: denture reline, replace missing or broken tooth, repair denture base. We discussed with the patient that a better option would have been to just make a new denture. 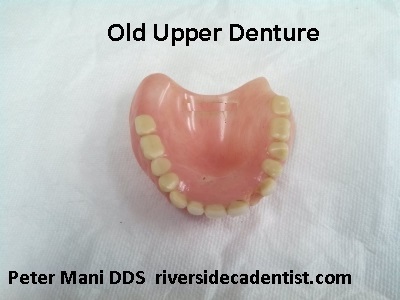 We offer a variety of dentures at affordable prices. Sometimes the price of repairing a denture will cost more than making a new denture. The best way to find out is to give us a call at 951-687-8700 and we will be glad to take a look at your dentures.